We are proud to hear bartenders and apothecaries alike call our shrubs the best on the market. Made with a traditional cold-steep infusion process with high quality organic ingredients, you'll understand why. With only whole fruits and herbs, our shrubs contain no sugars or fruit juices. 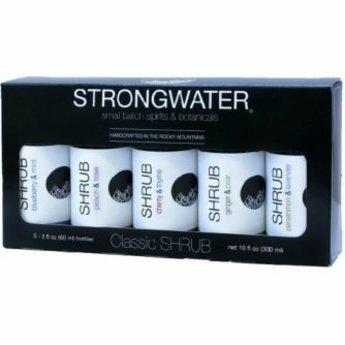 Enjoy all five Strongwater Shrubs (aka sipping vinegars) in this custom gift box that includes 2 oz. bottles of Blueberry & Mint, Cherry & Thyme, Ginger & Pear, Peach & Rose, and Persimmon & Lavender.